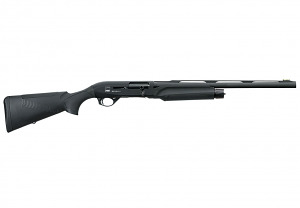 The choice of numerous 3-gun competitors, Benelli has taken the proven M2 Shotgun to the next level with the performance shop 3-gun edition. Equipped with Benelli’s ComforTech stock which utilizes gel comb inserts, 22 recoil-absorbing synthetic chevrons, and a soft, custom fit gel recoil pad combine to reduce recoil by up to 48% as compared to the competition. Equipped with enhanced features specific to 3-gun competition, the M2 3-Gun features the proven inertia-driven recoil system, over-sized bolt release, extended tactical-style bolt handle, modified carrier and enlarged loading port for speed loading, and HIVIZ fiber optic competition sight. 7.3lbs.